The DivanoXmanagua was the first co-creation project of craftsmanship and solidarity in Italy, in partnership with Terre des Hommes Italy and the Training Centre AFOL Meda. 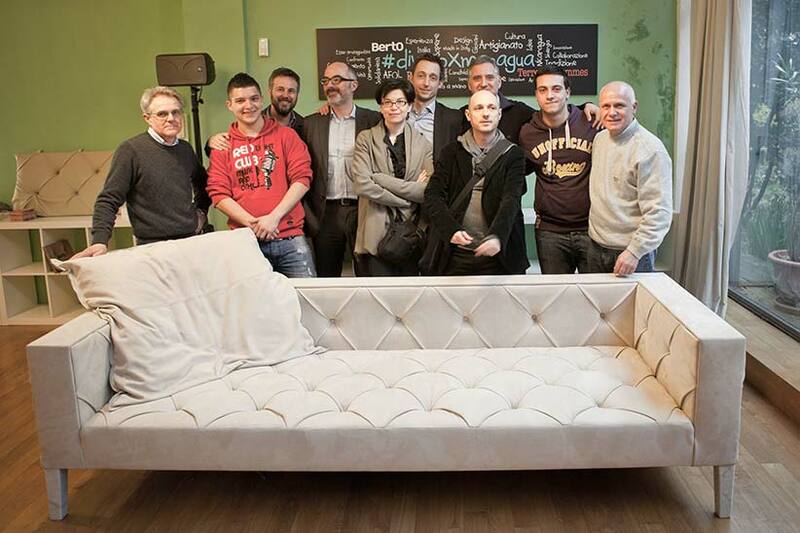 The artisan sofa was built collectively with the participation of students, friends, clients and craftsmen - in 6 workshops open to the public, beginning in January 2013 and finished in April 2013. 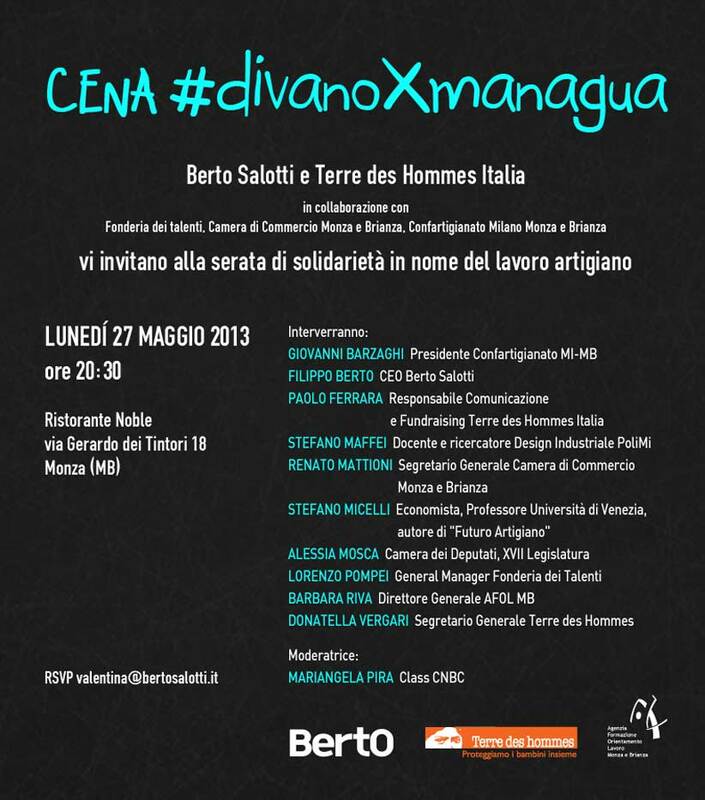 The #divanoXmanagua was destined to raise funds to finance the Carpentry School Mercado Mayoreo in Managua, Nicaragua in collaboration with Terre des Hommes Italy. The project #divanoXmanagua came from the desire of our company to give importance to the work of craftsmen and especially to reveal to young people, who are often ill-informed about the genuine value of Italian manufacturing in the global economy. The project was carefully narrated and shared on all social networks. It was well received by, Mr Alessia Mosca, by the journalist Beppe Severgnini and by professor Stefano Micelli, author of "Future Craftsman". On September 28, 2013, the first training course began in Managua, Nicaragua. After having met and worked with the students from the AFOL upholsterer’s course in Meda, now it is the students from overseas turn. Thanks to the participants and all the people who contributed to the #divanoXmanagua project by raising funds at the solidarity dinner last May. September 28th signifies the beginning of the first of two training courses, aimed at training future Nicaraguan artisans. The young people of Managua in search of opportunity and a career in the future now have the occasion to learn a traditional craft, such as the art of upholstery, thanks to the participation of Terres des Hommes Italy, our partners in the project. Online you can view and download the full program of courses in Managua. The solidarity dinner ended the first phase of the project. The first solidarity crowdcrafting project was documented in all its media forms: in video, photos, in print, posts and in blogs, in many national and international journals. Today the project #divanoXmanagua is also a book: from the very beginning in 6 workshops joined by architects, students, artisans and friends, all who participated to the solidarity dinner and finally to the finished work the sofa, the divanoXmanagua. FUNDRAISING company permanent "to catalog"
Online you can view and download the book. 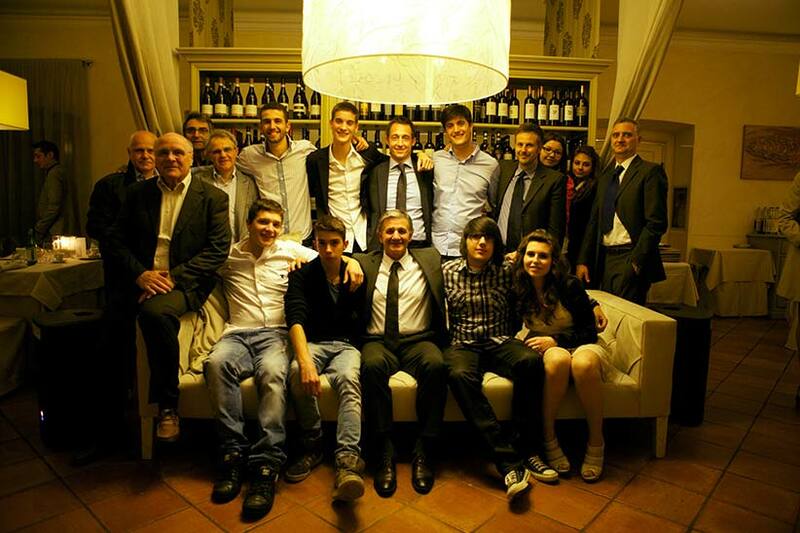 Monday, May 27th Berto Salotti and Terre des Hommes, in collaboration with Fonderia dei Talenti, the Chamber of Commerce of Monza and Brianza and the Confartigianato of Milan organized a fundraising evening at the Noble restaurant in Monza. The proceeds of this event were donated to the Center for training of carpenters in Managua, Nicaragua. On center stage the #divanoXmanagua, an evening of important testimonies related to the world of solidarity and the work of master craftsmen. A sincere thanks to all those who helped make the dinner Monday a success and a pledge of solidarity: Confartigianato MI-MB, the Chamber of Commerce Monza and Brianza, Fonderia dei Talenti, Stefano Micelli, Stefano Maffei, the Honourable Alessia Mosca, all of our friends, artisans and let’s not forget the "future craftsmen”. 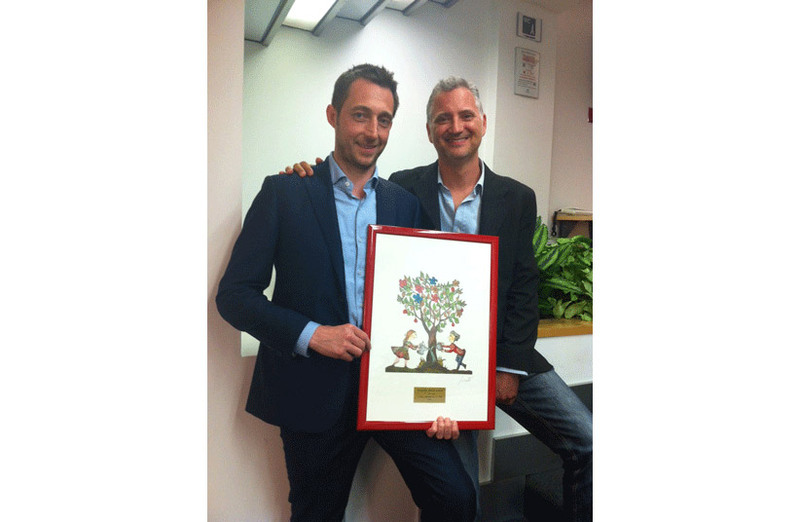 The event raised a total of €7,300 Euro. Our commitment continues. DIVANOXMANAGUA DINNERMonday May 27th Don’t Miss It! There will be a major event dedicated to artisan work and solidarity on Monday, May 27th, 20:30 at the Ristorante Nobel, Via Gerardo dei Tintori #18, Monza. The evening will host noted guests and visitors wishing to contribute directly to the solidarity project: Terre des Hommes Italy, Italy in Nicaragua for the work of future craftsmen. We hope to see you there! Minimum contribution for the evening: 150 Euro per person. Here is the result of six workshops of craftsmanship that were open to the public, 600 hands worked to make a very modern sofa, characterized by a strong innovative project and made according to traditional artisan techniques. 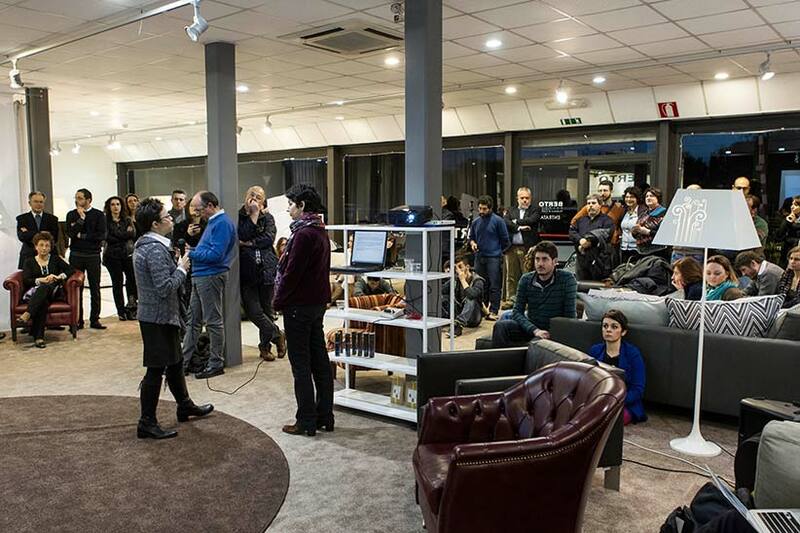 Thursday April 11th we will be at Coworking Cowo Milano/Otto Film, on Via Ventura at #3, in the neighborhood of VenturaLambrate. We will conclude the construction phase of the #divanoXmanagua in a one day workshop. Take a look at the program below! 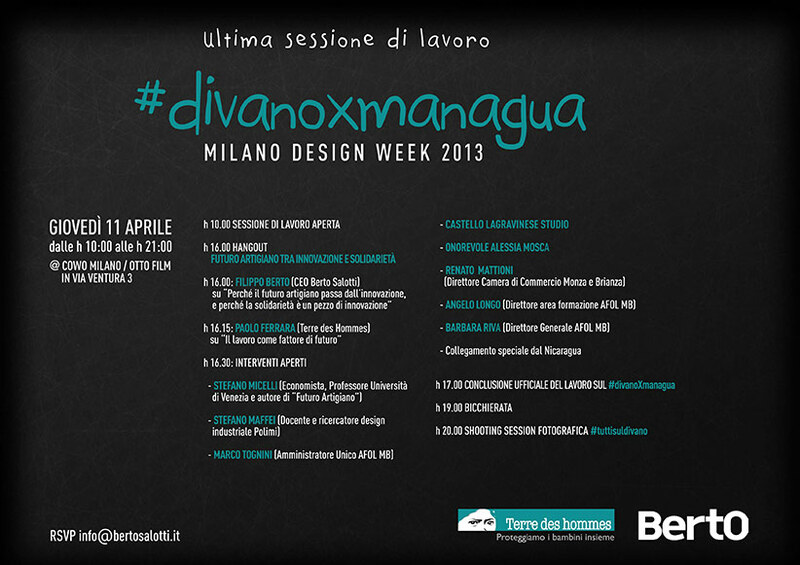 The fifth artisan workshop for #divanoXmanagua: special "baslètta day"! April 2rd at 18:00 in Meda, on Via Consorziale dei Boschi, #21. Location of the Berto Salotti Laboratory. April 2rd at 18:00 in Meda, on Via Consorziale dei Boschi, #21. Location of the Berto Salotti Laboratory. March 14th at 1800 in Meda, on Via Consorziale dei Boschi, #21. The third session in Rome has gone very well. The third workshop open to the public will be held at the Berto Salotti showroom in Rome, on Via Appia Nuova #1291, at 17:30. The Girl Geek Dinner (GGD) group of Roma will tackle the issue of Corporate Social Responsibility, participants include future artisans from the School of Upholsterers AFOL, Meda, architects, designers, journalists and curious onlookers. The event will above all be dedicated to the continued production of the capitonné finish. For more details visit our blog! Upcoming dates: March 14th, March 28th, and April 11th with the closing of the Fuorisalone in Milan. February 13th at 18:00 in Meda, on Via Consorziale dei Boschi, #21. Location of the Berto Salotti Laboratory. March 3rd at 17:30 in Rome, on Via Appia Nuova, #1291. Location of the Berto Salotti showroom. March 14th at 18:00 in Meda, on Via Consorziale dei Boschi, #21. Location of the Berto Salotti Laboratory. April 11th an all day event, Fuori Salone, Milan. For further information please contact us at: valentina@bertosalotti.it or call our showroom at 0362-333082.